Venturing a little further out of the centre of Rome there’s the neighbourhood of Pigneto (check out the article), worth a visit in itself for being an up-and-coming area boasting some of the best new bars and restaurants in the city. 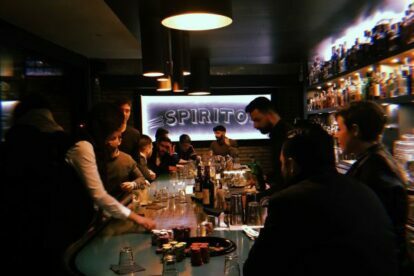 I’m still getting round to trying them all, but one of my favourites so far is Club Spirito, a speakeasy with a not-so-secret entrance in the sandwich shop next door. Part speakeasy, part American diner, it has a great internal courtyard and terrace hidden inside making it a perfect summer spot. It’s famous for its cocktails, and they do food too – mainly American classics. My favourite thing about it, though, is that in proper keeping with the speakeasy vibes it also has its own casino table – playing with other people in the bar is a great way to meet other people and make some local friends. It’s open until 4.30am too, so it’s a good shout for a nightcap – or two, depending on your luck at the cards!